Now add a little crunch and a little flavor to your soup with these crispy herb and garlic flavored croutons! 2 In small bowl mix olive oil, garlic and oregano. Keep the mix aside. 3 Apply this mix evenly on the bread. Cut the bread into cubes of desired size. 4 Pre heat Kenstar Air fryer at 180° C for 2- 3 minutes. Arrange the bread cubes in the fry basket and close it properly. Keep the Air fryer at 160° C for 8 minutes or till the bread cubes turn crisp. Remove when done. 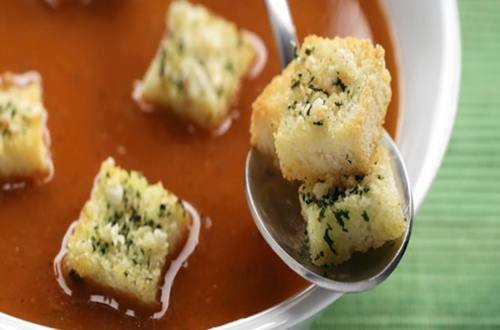 5 Cool the oxy fryed croutons and add it to your favourite Knorr Thick Tomato Soup. 6 Enjoy these crunchy croutons with Knorr Mixed Veg Soup, Knorr Creamy Mushroom Soup and Knorr Chicken Delite Soup. Now add a little crunch and a little flavor to your soup with these crispy butter and paprika flavored croutons!